magine you are living in 19th century Italy, you're 22 years old and studying music at the Conservatory in Lucca. In just a few weeks you will submit your first big musical composition to the Conservatory's Board of Directors: your final year project for your degree, the highlight of your young life... As I see it, Giacomo Puccini's "Messa di Gloria" represents a high point in his creative work - because can you really say this is "only" one of his early works? True, you sense the brilliance, the rapture and, indeed, a little of the lack of respect typical of youth - but in actual fact, this composition is simply too beautiful for a mass back in those days. It reflects the young artist's total passion and dedication. Unlike many people who see the "Gloria" as the climax of this composition, I personally feel that the real climax is the "Agnus Dei". And the fact that it reappears later - and almost unchanged - in the opera "Manon Lescaut" is surely no coincidence. lthough music scholars have been aware of the "Messa di Gloria" by Giacomo Puccini (1858-1924) for a considerable time, the piece only began to appear in concert programmes relatively recently. The score was in fact not published until 1951. Since then the work has been known generally as the "Messa di Gloria". It was first performed on July 12th,1880 at the Festival of San Paolino, the patron saint of bells, who is particularly revered in this part of Tuscany. This public performance brought the young composer general recognition. Puccini incorporated two other pieces of church music into the score of the Messa - a motet and a Credo that he had composed for the same festival in 1878. The entire composition had originally been conceived as a large choral work, but the final version is for two solo voices, a four-part choir and a large orchestra. 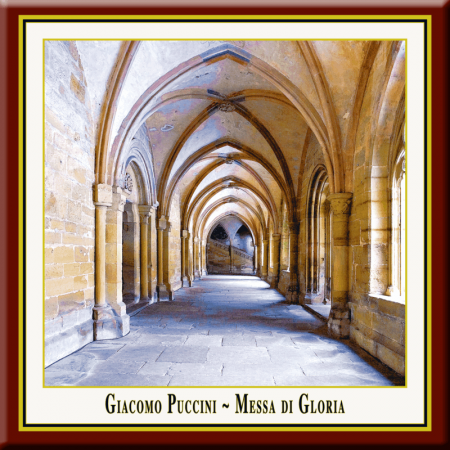 The Messa is thus the first comprehensive work by Puccini to follow the solid musical traditions of his family and deliberately use the "modern" methods of expression in vogue at the time. Puccini used his expertise in festive choral music and in adhering to the strictest conventions of counterpoint, and combined it with his own personal concept of a style for church and an innate feeling for melody that was present in him from the start. There is also a certain style to the sound that foreshadows the extraordinary mastery of orchestration apparent in his late works. Puccini was particularly fond of this early composition, proof that he attached particular importance to it. Echoes of the "Messa" reappear later in Puccini's operas, particularly in "Edgar" and "Manon Lescaut". In fact, the "Madrigale" in Act 2 of Manon contains almost the entire "Agnus Dei", with only very few structural changes. Bearing all this in mind, it is no wonder that Puccini's Messa is so highly appreciated today.